Two IRA bombs explode in London; 12 people injured. n North Sea, Luftwaffe accidentally sinks German destroyer Leberecht Maass; during rescue,German destroyer Max Schultz is sunk by mine. The first mass round-up of Jews in Amsterdam; 430 deported in reprisal for murder of Dutch Nazi party member. Bread ration in Jewish ghetto in Warsaw reduced to 3 oz per day. The Afrika Korps, newly arrived in Libya, launch their first probing attacks against the unpleasantly surprised British Army at El Agheila. 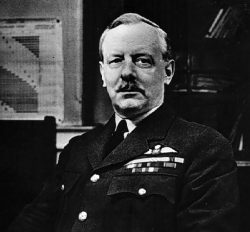 Air Marshal A. T. (Bomber) Harris is appointed C-in-C of Bomber Command. British forces in retreat less than 100 miles from Rangoon, the capital of Burma. President Franklin Roosevelt orders General Douglas MacArthur to leave the Philippines. Churchill is said to be ‘on the mend’ after a severe fever. Army Group Centre begins a counterattack in the area between the Dnieper and Donets. Allied commando raid on Myebon, South of Akyab in the Arakan, western Burma. Norway, Nazi collaborationist Quisling orders conscription of 35,000 Norwegian men for military construction. Battleship USS Iowa is commissioned, New York Naval Yard, first of four Iowa class battleships, the last US battleships. Malinovsky completes the capture of the mining area around Krivoi Rog. Heavy Japanese losses as the U.S. Navy bombards the Marianas in the Pacific. railways, bridges, ports and roads. After a heavy four-day battle, the U.S.Fifth Army takes the Upper Reno Valley in northern Italy between Bologna and Florence.